Editor's Note: Deann Borshay Liem's In the Matter of Cha Jung Hee premieres September 14 on PBS' POV. The following article appeared in the Winter 2009 Documentary about Liem's experience developing the film as a Documentary Film Fellow at the Sundance Institute Documentary Film Edit and Story Laboratory in Summer 2008. Eight Documentary Film Fellows representing four projects participated in the Sundance Institute Documentary Film Edit and Story Laboratory (www.sundance.org/documentary), held June 21-28, 2008, in the Wasatch Mountains at the Sundance Resort in Utah. Seven documentary filmmakers and six composers attended the Sundance Institute Documentary Composers Lab held August 3-8. Deann Borshay Liem attended the Edit and Story Lab with her film In the Matter of Cha Jung Hee. Editor Vivien Hillgrove and I had just started editing the documentary In the Matter of Cha Jung Hee when we received a phone call inviting us to participate in the Sundance Edit and Story Lab. We recognized that this was a rare opportunity and accepted without hesitation. But then I started to panic: Were we too early in the process? What would we show? Cha Jung Hee was a fellow orphan at the Sun Duck Orphanage in Korea in the 1960s. I did not know her and yet, just before I was sent to the US to be adopted by the Borshay family, my identity was switched with hers without anyone's knowledge. I was given her name, birth date and family history and told to keep the switch a secret. By a bureaucratic sleight of hand, my true identity was completely erased. 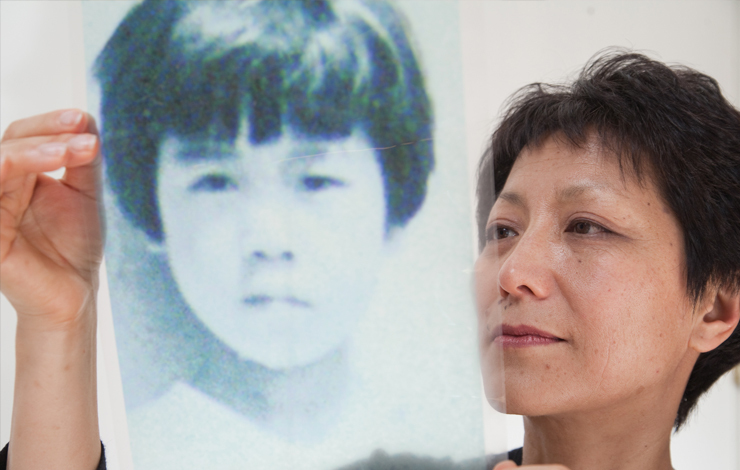 In the Matter of Cha Jung Hee follows my search to find this "double" in an effort to resolve mysteries about her (and my) identity, and to better understand the historical context that led South Korea to send 200,000 children overseas for adoption. A core part of the film covers a detective-like search in Korea for this elusive woman, as well as stories of various women named Cha Jung Hee. However, the film's material also includes fascinating interviews with Korean adoptees from Switzerland, Italy, France, Sweden and the US, as well as extraordinary archival footage of the Korean War. I felt, and still believe, that I need to do justice to all these interviewees as well as the historical stage upon which their stories unfold. But how best to do this? We decided this question would be perfect to tackle at the Sundance Lab but knew we had little time to prepare. In the weeks leading up to the Lab, we worked at a frenetic pace to develop the substance of our storylines so that we could maximize input from the Lab's advisors. In the end, we met our deadline and arrived at Sundance, exhausted but with adrenalin flowing. We brought two 40-minute partial assemblies representing the film's key story arcs-one personal, the other "objective" and historical. Our goal was to get advice from the Lab's advisors on how best to merge these two threads into one coherent narrative. Our mission was one of many at the Lab. Each of the other projects faced unique dilemmas and choices of their own, and we learned valuable lessons from all of them. The other director/editor teams included Natalia Almada and Daniela Alatorre with El General, N.C. Heiken and Peterson Negreiros Almeida with Kimjongilia, and Jennifer Maytorena Taylor and Kenji Yamamoto with New Muslim Cool. Every filmmaker has dreams of being able to focus on the creative aspects of his or her craft without the headaches of fundraising and technical setbacks. Our hosts at Sundance knew exactly how to make this dream come true. Before arriving, we had shipped our media on external drives provided by the Lab. Each team was assigned a fully functional edit trailer and a dedicated assistant editor. Our trailer matched our edit room back home, and our assistant editor, Scott Burgess, had already tested the set-up to make sure all was ready to go. As if this wasn't already an accommodation beyond belief, an expert technical support team was at our disposal throughout the week, and all our meals were prepared for us. Free of the demands of daily living, we were able to roam unexplored regions of our subject matter and our imaginations, surrounded by breathtaking natural beauty. Before jumping into editing, we screened our works-in-progress. To our relief, advisors and fellow filmmakers alike responded enthusiastically to our assemblies, especially the Cha Jung Hee storyline. The post-screening discussion was constructive and encouraging and addressed character development, structure, voice and intent. People pointed out the areas of the film that were strong and those areas that needed work. What was most encouraging was that, in spite of its preliminary nature, people could see the film's potential. And through their eyes, I could see the film's potential anew. The next day, I was hoping for some long, uninterrupted hours of editing. We had received detailed notes from the screening (the staff actually transcribed the screening notes and printed them out for us!) and were ready to roll up our sleeves. But this was not to be. As soon as we got settled into the edit trailer, our primary editing advisor, Mary Lampson, arrived for a detailed discussion about the film. Next came what seemed like a stream of advisors, sometimes in pairs, throughout the day for more feedback and discussion. I quickly understood that rather than the long hours of editing I was hoping for, we were getting something entirely different: extraordinary conversation about the film with world-class filmmakers. Without exception, each advisor offered a new way of looking at a story thread or character, a deeper way of connecting disparate themes, or fresh ways of looking at structure. These conversations opened up ideas that allowed us to spend the rest of the week experimenting with intersections between the personal story and the historical arc. This individualized consideration was given to all the teams, and it formed the basis of our Sundance experience. In between edit sessions, we participated in presentations and screenings of the advisors' work. Mary started off the series by talking about working with some of the greats of documentary filmmaking, including Emile de Antonio, Ricky Leacock and DA Pennebaker. She screened early work from de Antonio, including a segment from Underground. Her presentation set the tone for the others that followed, and grounded our thoughts in a historical context. Laura Poitras then screened parts of My Country, My Country as well as a work-in-progress of the second film in her trilogy, The New American Century. Kate Amend showed segments from Into the Arms of Strangers as well as Beah, A Black Woman Speaks. Sam Green screened a segment from The Weather Underground and a series of his short films. Woody Richman showed Trouble the Water and segments of Bowling for Columbine and Fahrenheit 9/11. Lewis Erskine screened a segment of Jonestown as well as pieces he edited from Ken Burns' Jazz series. Of most interest to me were the personal stories of the filmmakers and the careful analysis of their films. Lewis, for example, talked about the impact of Emmett Till's murder on his life as a young man. There came a moment, he explained, when at a young age he realized that outside the comfort of his surroundings he was not safe for the color of his skin. This brought me to tears. Kate presented before-and-after comparisons of openings to Beah, A Black Woman Speaks and Into the Arms of Strangers. These comparisons allowed a unique window into the editing process and the careful crafting of a film's opening scenes. The advisor presentations always inspired us with new ideas, and I came to understand that this was by careful design. The Lab itself had been a work-in-progress for many months before we arrived. The meetings of the advisors and staff that we witnessed every morning were just the tip of the iceberg of long-term planning involving not only the careful selection of team participants but also a match-making process for bringing in advisors with outlooks and experiences tailored to the needs of each project. Throughout the week, we were the beneficiaries of the far-sighted vision of the Lab organizers as well as their ability to anticipate our needs as the week unfolded. For example, just when we all needed a break from the intensity of our work, documentary film program director Cara Mertes took us on a hike into the mountains for some exercise, fresh air and a chance to get to know each other better. Woody walked with me, sharing stories of his childhood and his experiences around race and adoption. We stopped to take in views and admire wildflowers. When we reached the top, the Institute staff pulled out bottles of wine from their backpacks. The hike was perfectly timed--but even more so, the wine. Originally, I considered the search for Cha Jung Hee a narrative tool to explore Korean adoption history and saw my own character in the film in a limited role. This assumption began to change during one of our advising sessions with Mary. She shared a personal story about duality and living a false life, and in listening to her story, it began to dawn on me that there was unexplored terrain in my own life-ideas about love, guilt and forgiveness-that was central to the film but which I had perhaps been avoiding. When we returned home, we continued to work with both story arcs, utilizing the intersecting points we had developed at the Lab. However, with Vivien's steadfast encouragement, along with insights from co-producer Charlotte Lagarde, I began to realize that the glue that holds together the stories of the Cha Jung Hees is my own story. The film is not so much about my "double," but my own need to resolve this one pivotal occurrence that determined my fate. When I finally embraced this concept, the film began to come alive and take its final shape. The seeds for these insights and the film that finally came to fruition were sown at Sundance. Deann Borshay Liem is a filmmaker based in the San Francisco Bay Area. Her previous film as director/producer was First Person Plural, which premiered at the 2000 Sundance Film Festival.